In Loquiz iBeacons can be used as task activators, meaning that they open tasks once the mobile device is in the range of Bluetooth beacon. Beacons are additional activators – all the regular activators (GPS, QR-codes) still work, but beacons can be used in addition to those. Beacon implementation is in Beta. Please test before use! Beacon technology is useful because it can be used indoors. Players do not need to do anything special. Once they arrive in beacon range, task connected with this beacon opens. Beacons still follow the game specific rules – if the task has already been opened or is not yet discoverable, it will not activate. Beacons can be used in all game types except quiz. Beacon works like a lighthouse – beacon sends out the Bluetooth signal, letting the mobile devices around its range know that it is there. Beacons are not connected with devices or with the internet, they just send out the signal. Beacons have unique identifiers – called IDs. Make sure your mobile devices’ Bluetooth is turned ON, otherwise your devices will not receive signals sent by beacons! When you purchase beacons you will find out their ids with the beacon producer app or any beacon scanner app. It is important to check that at least one ID is unique (it is common that MAJOR and MINOR are the same across the range and the only UUID differs). Loquiz is checking for all three ID-s and only activates task if all of them are found and correct. New place for setting the beacon activation is in the Edit task Activation tab. You need to modify each task separately if you want it to be activated by a beacon. 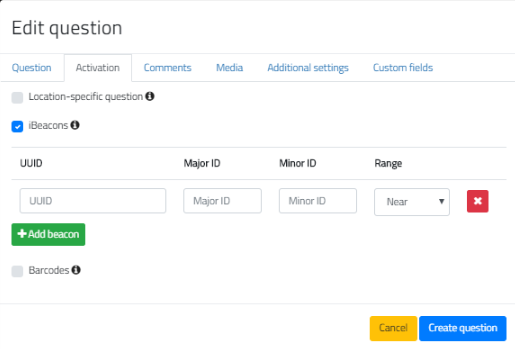 Open the task for editing and choose “Activation”, tick iBeacons and press “+ Add beacon” and enter beacon’s UUID, Major ID and Minor ID, and range Near or Far. The range affects how far from the beacon the task activates. Range can have two values – NEAR or FAR. They are not exact values as the activation range depends on the beacon itself, the placement, the surroundings etc. Even the number of people in the room will affect the beacon range. But generally in empty room Near should be around 0-2meters and far should be 10+ meters. To find out your beacons ID-s you can use general beacon scanner apps. To modify beacon transmission power and ID-s use specialized software. For example, to manage Estimote beacons Estimote compay offers special app for mobile devices. Different beacons will behave differently so test with different settings to understand the real activation distances. To use beacons you need to create a game and include the tasks that have beacon ID-s attached to them. As beacons work as additional activators, locations still need to be set for all the tasks. If you want a task to open only with Beacon, set the location radius to zero or set the location far away from the playing area. You can also use an invisible pin and transparent area, so pins are not visible on the map. Use short intro (can be up to 25 characters) to guide people right there on the map. 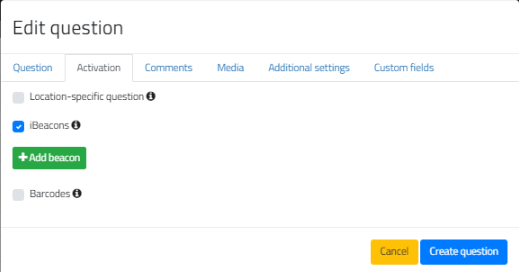 Use after answer comments to add information about how to find the beacons. Then the players know where to go next after answering the task (this works really well if players need to go inside to perform a task in the outdoor game). Use welcome text (intro message) to guide players to the right locations where beacons are hidden (this works really well if there are a couple of places you want players to visit and you want to mention it separately). Add a picture overlay on the map that shows indoor beacons only (this works if the game is in one place, the “map” can be always accessed an used for passive navigation). Announce the beacon locations using built-in Chat functionality. Print out separate instruction sheets that include clues about beacon locations and hand them out to the players. Position the beacons so that the radio signal is not blocked but also the beacons are not easily visible. Test the game to understand if beacons work as you planned, what are exact beacon ranges and do they activate the tasks. Remember that if you put the beacon chest height and there is lot of people in the room, the activation range will be considerably shorter. In some surroundings, you can find fixed beacons. Museums and some stores use beacons to enhance customer experience. As Loquiz uses beacons only for task activation and observes only Beacons ID-s the fixed beacons can be used in games as well. 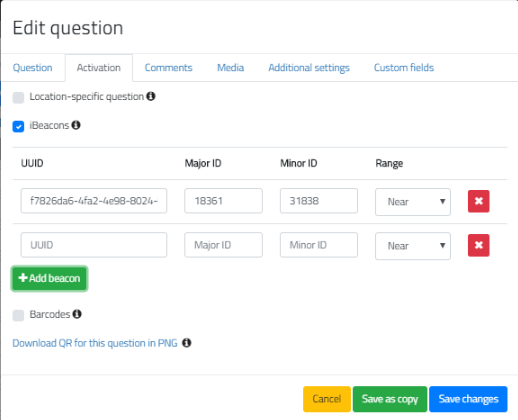 Map the beacon ID-s with suitable software, modify tasks instructor comments accordingly and you can run a game built on existing infrastructure. Beacon integration into Loquiz is in development, write to info@loquiz.com if you have specific tasks.